My first BB cream by Skin 79 had ended its life last month and I started using my Oriental Gold since few weeks ago. Found out that the application of BB cream need to be pat on to our skin and not by spreading it all over our face. The effect of patting makes our face looks more radiant and covers most of my dark spots. FYI, spreading BB cream like moisturiser could make our skin condition worst, especially for those who have pimples on their face. Therefore, patting is the correct way of applying it. The 3 main functions of this BB cream are whitening, wrinkles improvement and UV protection of SPF25 PA++. Besides, I love the combination of 3 different type of teas (black tea, white tea and green tea), I smell like tea each time I applied! The benefits of those teas are brighten and firming our skin. Nice~~ It makes my pore looks smaller even I applied a thin layer of it. Saw the pink coloured blusher? I use it as my blusher lately and I like it too. Is like a combination of foundation and blusher - all in one! Some more, it could applied on to our lip as lip gloss too! 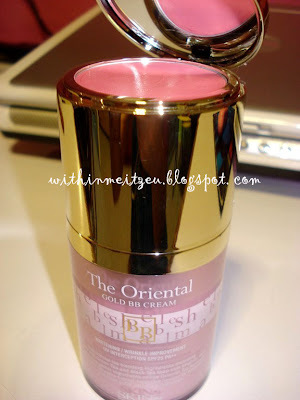 I love Oriental Gold BB Cream more than the first BB cream in Hot Pink! p/s: Remember to remove BB cream with make up remover just like the steps of clearing our face. finally u're using it already! hehehehe...i've tried the diamond one looks good too!!! Previously I bought my Pink BB at Centre Point during their road show. No outlet there as what I could remember. U can find BB cream from City Mall, I think u know it right? And another thing is I bought My Oriental series from an online seller in town. But, I forget which one oledi. Jo here. Thank-you for your swift response. Someone introduced me to the Oriental BB product yesterday. She doesn't use the entire range of the product, just the liquid foundation pump. I have to say that it looks absolutely flawless on her skin! Yes, she did mention that she bought the foundation from City Mall but can't remember the name of the shop as it has been quite some time since her last visit to the Mall. I went and searched from the City Mall directory online but couldn't find anything that sounds Korean under the Health & Beauty search option. Can you help? I don't have any special beauty regimen of my own, to be honest I've been using SK-II Facial Treatment Essence for over 5 years now and it works wonders! It's rather pricey, 450ml @ RM450+. But it's worth every penny in a long run. 450ml usually last me nearly half a year! Yea.. I did tried SK II before. It do have amazing result, especially the magic water (forget what it called). Haha. :D Food is another cheaper method to enjoy life, besides travelling which use much more money. Kekeke. Yea! I ‎​♥ that the blogger posts about food every where too. Hehehe. Thanks for reading my other posts too. Hope u enjoying them much!